Some of you out there have great ideas for businesses, but don’t have a dime to shell out for a website. It happens to the best of us. So while you’re saving your pennies for a more robust and professional website, here’s how to build a simple webpage for the interim. Don’t let code scare you. It’s just characters – just like the ones you’re reading right now – it just looks a little different. It’s like learning a new language – things look foreign at first, but the advantage you have here is you don’t have to know what things MEAN right away – you just have to know what things DO. If it doesn’t look like the image above, be sure you were in plain text mode and that you saved the file with the extension .html on the end. 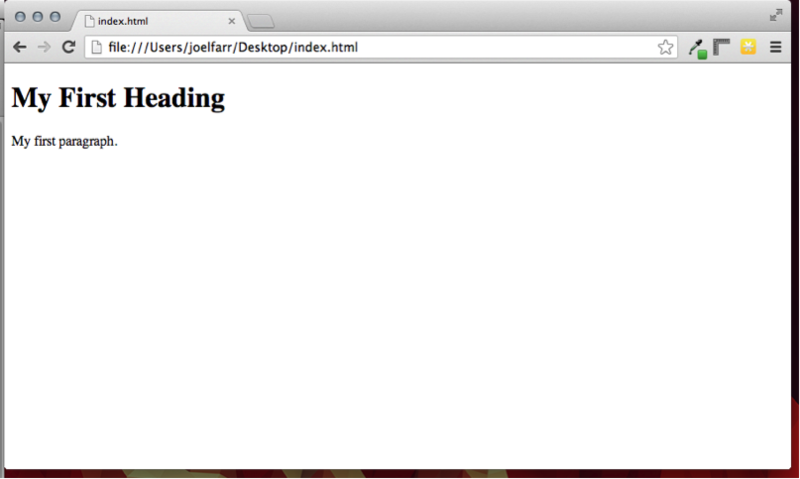 Congratulations, you’ve just built your first webpage! I know what you’re thinking – wow, that’s pretty ugly. Bear with me, we’ll make it look better in step four. 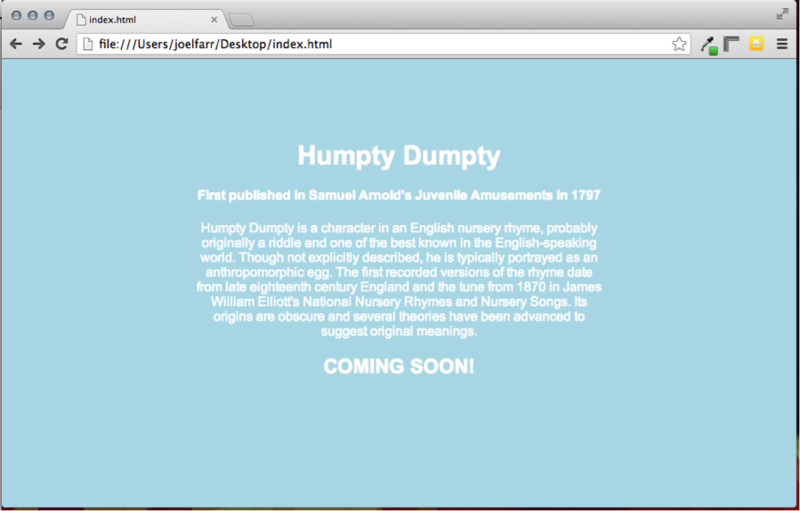 You’ll notice that the text “My First Heading” was a lot bigger when you viewed it. This is because it uses a different tag than the “My first paragraph” sentence. One starts with <h1> and the other with <p>. The tag <h1> stands for heading and <p> stands for paragraph. When you’re done with a specific tag you simply tell it you’re done by adding a / like so: </h1>. Then you can move on to the next tag. There is only one paragraph tag, but there are six heading tags as follows: <h1> <h2> <h3> <h4> <h5> <h6> The number portion of the tag determines the size with 1 being the biggest. You can see this illustrated if you add this to your code. Be sure to resave and then refresh the page in your browser to see your changes. 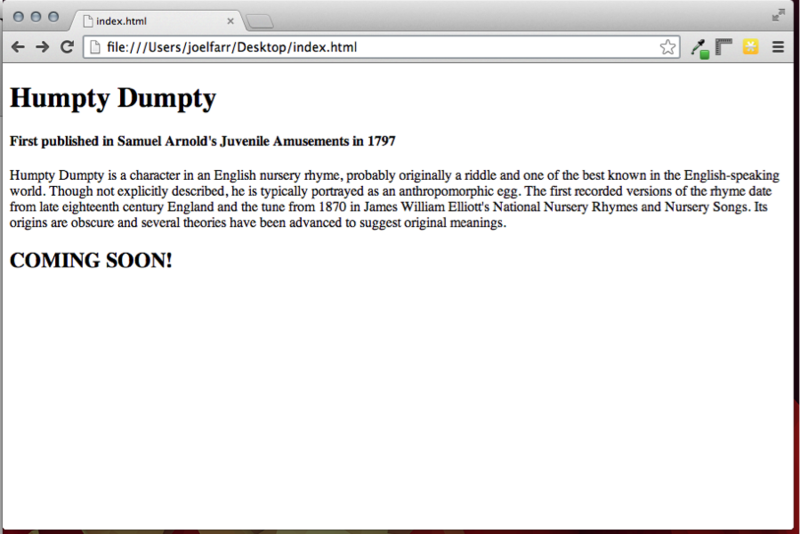 Your page should look a little more sophisticated by now – even if it is about Humpty Dumpty. Great! But it’s still ugly right?! Ok, let’s give it some color and formatting. We can add a little style and color to our webpage simply by typing in a few more lines. I’ve highlighted what I’ve added in blue. Most of the information we added is pretty self-explanatory. We told the browser, through code, that we wanted to change the background to light blue, the font to Arial, the font color to white, and lastly to center it all up nicely and give it a width of only 500 pixels. Pretty cool, right? Go ahead and play around with those numbers and settings to get a look you like! 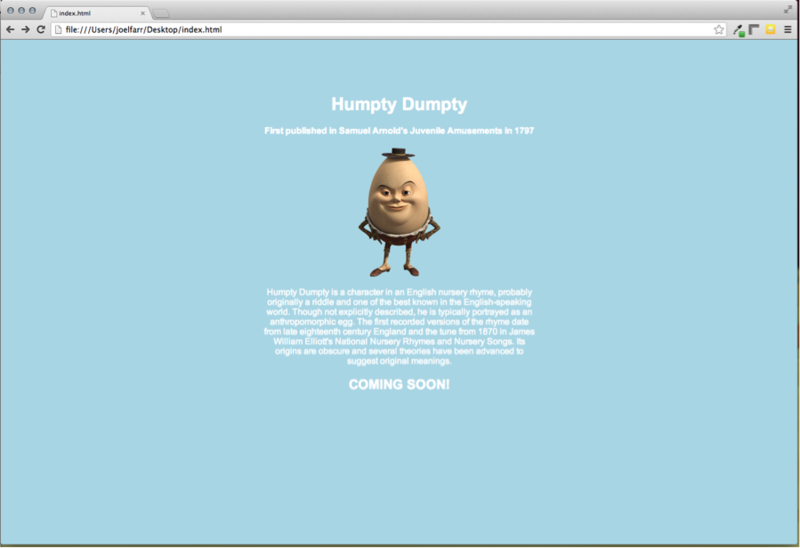 In our last step we’ll go crazy and add a picture of Humpty Dumpty to our launch/landing page to give it some more visual power. First, you’ll need an image. You’ll probably want an image with the extension of .png instead of .jpg. This file type allows transparent backgrounds and makes things look much nicer. Once you have your image, be sure to put it in the same directory that your code file is in – otherwise things won’t work right. You also may want to size your image appropriately. Since we are using a 500 pixel width here for our content area, we’ll want to be sure the image is quite a bit smaller than that. You should have enough knowledge now to add text, headings and images to your webpage! If you made it this far, and want to learn more, I recommend heading over to W3School’s website and learning other tags, more code, and more about styling your webpages. 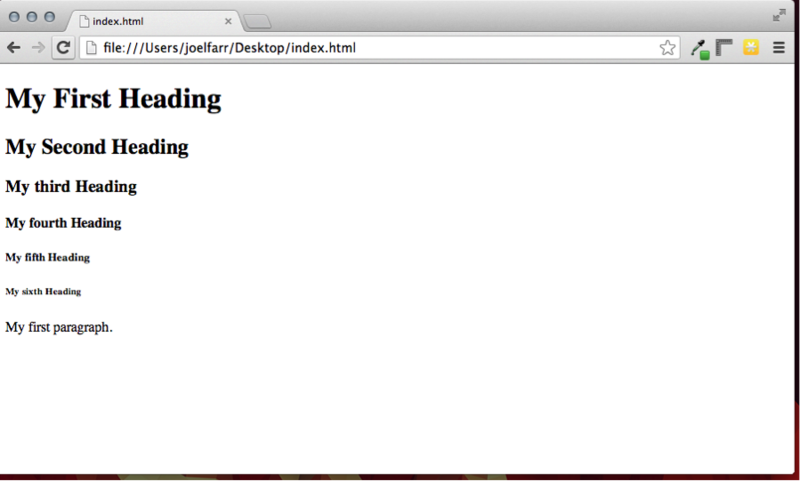 You could also visit this site as an HTML resource to get started. If you’re having trouble – or things aren’t quite working right – feel free to leave a comment below and I’ll do my best to help you out!